As album titles go, The Art of Living may not be the most inspired choice in the world. It has a certain adolescent ring to it, like the sort of thing you�d expect to find on the cover of your kid brother�s emocore demo rather than that or a virtuoso power metal outfit. Ignore the name though, and one listen to this dramatic, exhilarating piece of art reveals that Israel�s Sensorium are anything but adolescent. As accomplished a debut album as you�re likely to find, �The Art of Living� is a seriously well-crafted body of work, displaying a maturity that comes as something of a surprise when you learn that this is a band still very much in their infancy. First coming together in 2012 and settling on their current line-up two years later, it was only that year -2014- that Sensorium began recording an album which for all the world sounds like its the work of a skilled ensemble with many years under their collective belt. From the classical guitar of the brief introduction all the way through to the chilling piano and breathtaking operatic vocals of the closing title track, The Art of Living is just as beautiful and arresting as it is aggressive and determined. In between those two tracks, there�s a collection of songs which blend seamlessly into one another, each one building on the last to create an enchanting album which needs to be felt rather than heard. Indeed, it�s best taking �The Art of Living� on as an experience, as an adventure through the dominating mountain tops and lighting-struck skies of the band�s imagination, rather than it is as a simple set of songs. Not that those songs themselves don�t hold their own appeal. Sounding at times like Finnish symph-metal heros Nightwish putting their own stamp on Metallica's �Master of Puppets� album, and at others like Luca Turilli's Rhapsody doing their best to sooth the souls of an aggravated goth metal band, the album swoops and storms in equal measure, one minute soaring through daunting, blackened skies, and the next emerging into some glorious pool of light where the unabashed over-the-top joy of power metal reigns supreme. And whilst it�s fair to say that Kesenia Glonty�s remarkable vocal presence is what leaves the biggest impression here, that�s to take nothing away from her band mates (Michael Timoshko on lead guitar, Sasha Korg on keys, bassist Gilad Bardo, drummer Carlos Bartov and Anton Feldman on rhythm guitar), undeniable skill and creativity, as best evidenced on stands-outs like recent single Haunting Verity and the awesome Thousands of Stars. Playing such tracks over and over (as you won�t be able to resist doing), what soon becomes apparent is that what Sensorium lack in original album titles, they more than make up for with a huge imagination and a talent for making the kind of exciting and dramatic power metal songs, all of which make The Art of Living one of the genre�s most impressive debuts. 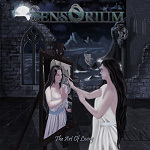 An accomplished debut album from an operatic power metal band whose skill, creativity and imagination combines to create an impressive set of well-crafted gems.